Use the code samples below to learn about Android 7.0 capabilities and APIs. To download the samples in Android Studio, select the File > New > Import Samples menu option. This sample demonstrates how to take advantage of multiple window user interfaces with your app. 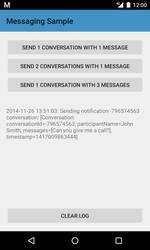 This is a pre-existing sample which shows a simple service that sends notifications using NotificationCompat. Each unread conversation from a user is sent as a distinct notification. 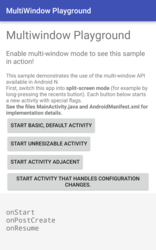 This sample has been updated to take advantage of new notification features available in Android 7.0 (API level 24). This is a pre-existing sample which demonstrates how to use NotificationManager to tell how many notifications an application is currently showing. This sample demonstrates how to store and access data in a device encrypted storage which is always available while the device is booted. This sample demonstrates how to read and write data from specific directories, while requiring fewer permissions.